We make things more convenient by renting portable storage containers. We don’t sell our containers. We’ll deliver our ground level storage units to where you need them, and we’ll pick it up when you’re done. 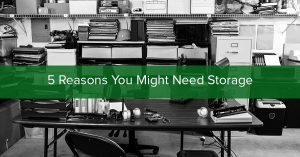 There are plenty of reasons why you might need extra storage and A.B Richards wants you to know about 5 common reasons and how we can make your life easier. If your business is renovating or moving, things can become chaotic if you don’t have extra space. You may need to clear out furniture, equipment and important documents, but at the same time, you need to keep things running and have things as close to your office as possible. That’s why A.B. Richards is ideal. Our portable storage containers give you a secure place to keep those items related to your business that you have to keep nearby. There are a lot of businesses that operate seasonally that need storage during the off-season. You might need to hold on to seasonal inventory for six months or you may simply be closing up shop for the season and need extra space for office furniture. A.B. Richards storage units are perfect for holding onto skiing equipment or beach gear you’re selling when they’re out of season. If you run a business out of a small space like a shack or kiosk, we’ll give you the space you need. If you run a business you know that your records and important documents can pile up quickly. If you’ve been in business for a long time you may have accumulated voluminous numbers of records. Federal, state and local agencies require you to keep records, often for several years. In fact, the IRS publishes guidelines on record keeping. If you run a business or are part of a union, educational institution or any other organization that keeps a large number of records, why not keep them close by in a secure portable storage container? Keeping track of inventory can be a tricky thing if you run a retail-based business. Sometimes you can have too much inventory or you may have overstocked items. Sometimes you may not have enough of what you need or can’t get to it quick enough. That’s how A.B. Richards can give your business a boost. Keeping a portable storage container nearby will save you time and money. If you run a construction company or if you have a business that requires you to work remotely, it makes things easier to have your equipment and supplies as close as possible. All of our storage containers are made out of 14-gauge steel and your A.B. Richards container can be padlocked. Whatever your storage needs are, A.B. Richards can help. Just tell us what your storage needs are and we will get the portable storage unit you need. Contact us today.